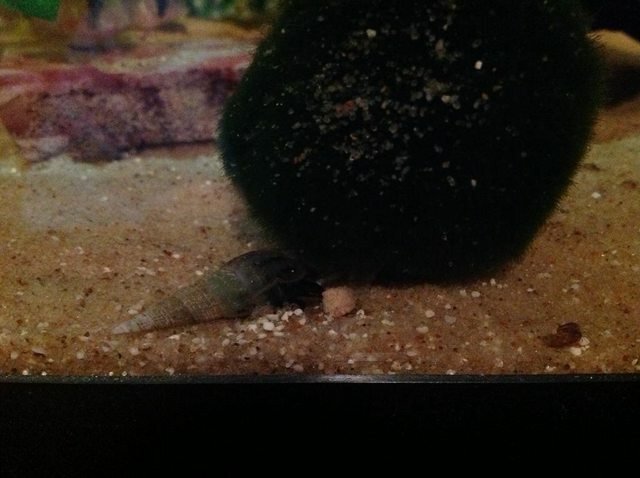 Just bought some sand from a guy here for our 125 gallon & it came with some snails, apparently. But they do not look like snails to me. At least not typical ones. its a snail. mostly beneficial. they can be a nuisance if you overfeed, however they are good as tank cleaners. Looks very much like some of my assassin snails!! those are not assassin snails, they are your typical malaysian trumpet snails or the Other MTS. Populations can be easily kept in control if you are not overfeeding your fish. Ah ha! Shows what I know. Actually I have never seen MTS, so what do I know. They are shaped like my assassins. 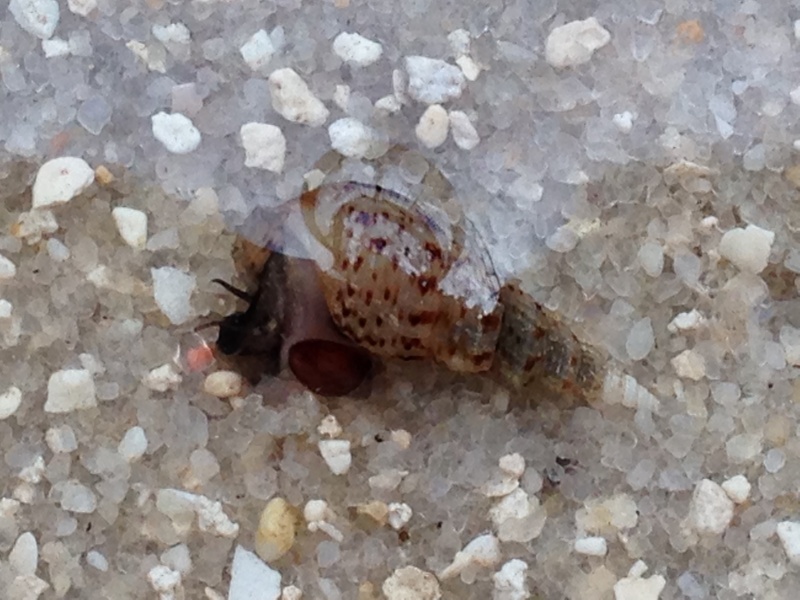 I saw one of them kinda wag that end part of the shell like a tail. That is a MTS snail for sure. I have have hundreds of them. Here is a pic of Merlin eating a pellet, it was taken with the iPad, so not very clear, and you cannot truly appreciate his colours! @nyleveiam wrote: Ah ha! Shows what I know. Actually I have never seen MTS, so what do I know. They are shaped like my assassins. I am sure you have seen the symptoms of MTS though! I never had any, then I got some plants that had one tiny baby in them..
That thing is now much bigger! I'm happy I have some and didn't have to pay for it! Usually, you should see them more at night crawling everywhere. To me, this is a scourge, a pest, the aquaristic version of rats in the basement... I have had them in my tanks for years. They don't live long, and die in their shells under the gravel, fouling your water. If I only had one, I would take care of that very quickly before they spread. I don't see it as good news - I admire rats for many of their qualities, but if I found one in my house, it wouldn't be here long. @GaryE wrote: To me, this is a scourge, a pest, the aquaristic version of rats in the basement... I have had them in my tanks for years. They don't live long, and die in their shells under the gravel, fouling your water. If I only had one, I would take care of that very quickly before they spread. I don't see it as good news - I admire rats for many of their qualities, but if I found one in my house, it wouldn't be here long. I think my fish (or possibly the other snails) must eat ours after they die as all of the deceased I have found thus far are empty shells! I suspect it is the ramshorns that are eating the dead for the most part. I say that because, when we lost our guppy Larry, it was the ramshorns that were all over his poor little body, not the MTS. I am guessing the MTS would also eat the dead, but perhaps the ramshorns are faster or better able to sense death. I suppose our loaches probably find the dead ones in the sand, I have never seen them eat a live one (and yet our tequilas do!! ), but I assume the loaches would snack on one that was dead as it is "Less work". Oh my, as I am typing this, there is an eerie feeling surrounding me....sooo, on to something more pleasant....perhaps I'll take a stroll through the eye candy section to shake this off! Gary, this is a lot of hatred towards a snail! Steve would be happy to see you wrote that! If the snail dies, one with a lot of plants would see this as fertilizer no? Ok so I'm getting mixed thoughts on this snail. Some say it's good for the tank while others say it's a pest. I placed 3 in my currently running 130 gallon tank. Should I kill them when I see them? The rest, I believe I scooped all of them out of the sand before dumping the pails into the empty 125 gallon tank. But they would die fast without any source of food other than what might be in the sand now correct? @Sandman1969 wrote: Ok so I'm getting mixed thoughts on this snail. Some say it's for the tank while others say it's a pest. I placed 3 in my currently running 130 gallon tank. Should I kill them when I see them? My two cents: I think that they are beneficial in that they will move the substrate around, thus decreasing the chances of ammonia pockets, and they will eat any left over food. We have had them in our 220g and 10g for well over a year and we have had no snail explosions in either tank, nor have we had any problems with water chemistry. Any fish that digs will do as much as the snail, and much faster. I tend to see them as living ammonia pockets themselves, as they can be dead for days before you realize it. I siphon them out with every water change and keep a fair control on their numbers, but to me, while there are positives, they are outweighed by negatives. If I could get into Hogwart's School of Wizardry and Snail Control, I'd happily wave a deadly wand at the ones I have had here for forever. It can come down to the simplest of questions - do you find them interesting? If you do, the positives come out on top. Well Gandalf ! We'll watch for you as the Sun rises in the East. Assemble the Snails, Bettas, man the parapets, Helm's Deep has never fallen ! Lol Gary, I share similar sentiments towards pest snails, but not quite as strong! Haha. So I put 3 of these in my 130 gallon tank and have not seen them for about a week now. Don't worry; they will be buried in the substrate, eating all they can! They will appear again, maybe even in larger numbers!